Understanding the testing requirements and standards will ultimately save testing time and cost. 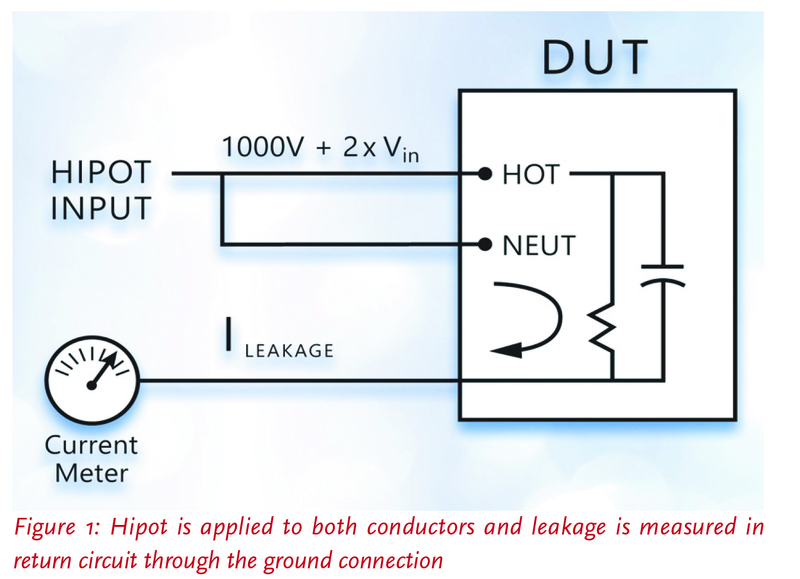 Hipot testers offer a range of capabilities starting with dielectric withstand and insulation resistance testing but also, in many instances, providing accurate low-resistance measurements and low-resistance/high-current outputs to test ground resistance and ground bond integrity. Selecting the right one for your application will ultimately save both time and expense in performing these essential tests. Manufacturers must submit samples of their products to recognized certification agencies. National Recognized Certification Laboratories (NRTLs) include UL, VDE, FM, ETL and others. The agency certification process is conducted to confirm compliance with the relevant standard(s). It is vitally important that your selection of hipot tester is capable of being set up to perform testing to meet the relevant standards. Periodic inspection and calibration of test equipment is a standard requirement to maintain NRTL certification. Agency inspection will include check of hipot instrument calibration certification. This “cal cert” is typically required on an annual basis. (UL and other NRTLs require compliance certification with ISO17025.) 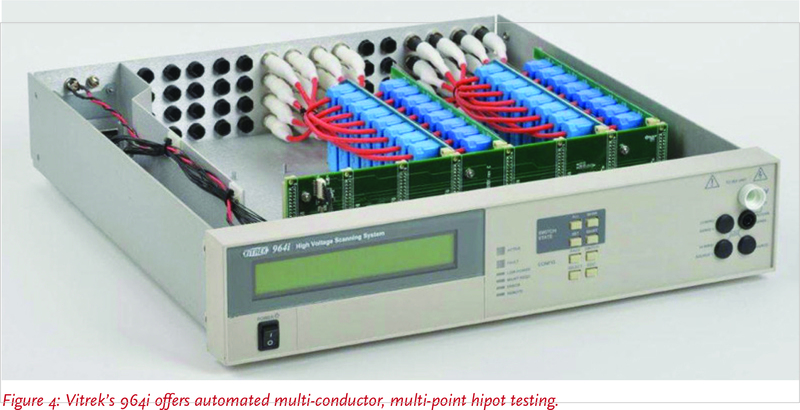 Another common requirement prescribed by most NRTLs is a daily functional test of the hipot equipment. 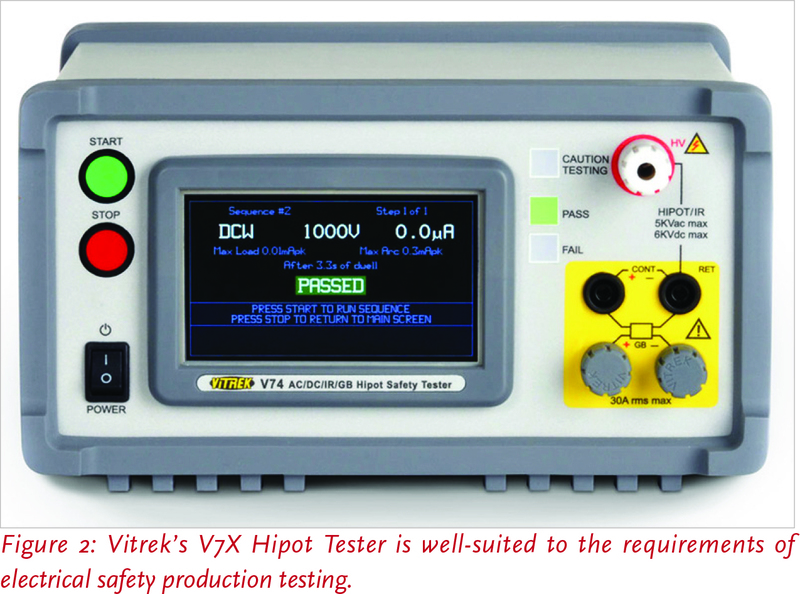 The basic hipot test applies a high voltage from the conductors to the chassis of the device-under-test (DUT). This test is often referred to as “dielectric” or “voltage” withstand. Its purpose is to confirm that the insulation and isolation of the non-conducting surfaces from the operating voltage is sufficient to avoid a shock hazard. The typical specification for this test is: 2x (normal operating voltage) + 1000V. 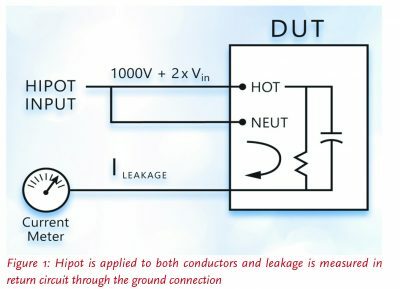 Both AC and DC hipot tests are possible and, in general, the same test should use the same type of voltage as it would be during normal operation. 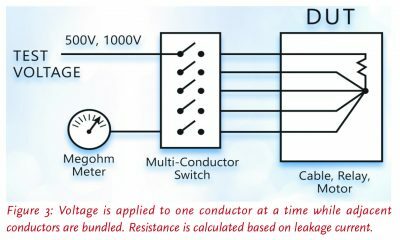 However, if a DC hipot test is used on an AC circuit, the hipot voltage should be two times the peak (2 x 1.4 x RMS) + 1000V. the leakage current measured is less than the maximum allowable current. 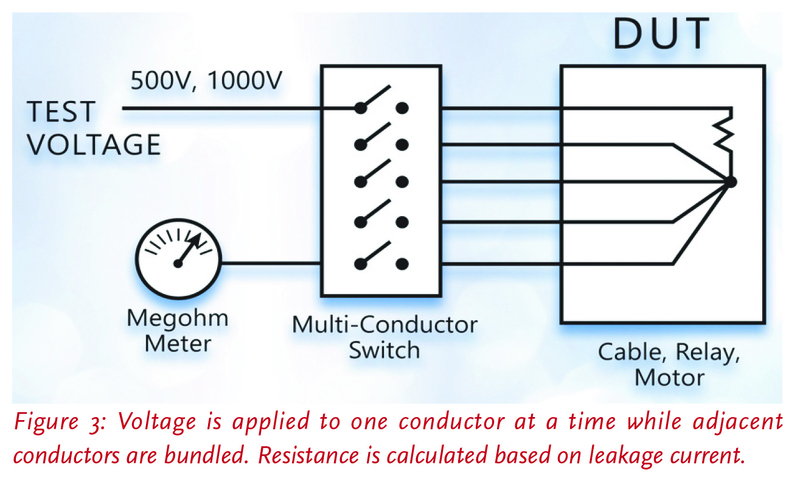 For double-insulated products, higher voltages will often be specified in the test standard. In addition, this class of device typically requires special fixturing to connect the non-conductive outer shell to a conductive element. Defects that are often detected with the hipot test include contamination (dirt, debris) and lack of proper spacing (creepage and clearance) of components. Creepage is measured across surfaces, clearance is the air gap between components. Contamination would likely cause an unacceptable level of leakage current. Clearance problems could result in breakdown. Insulation resistance testing is likely to be required in motor winding, transformer winding and other applications involving cabling or insulated wire. Insulation resistance testing typically involves confirming that the resistance exceeds a defined high resistance value. Ground continuity testing is performed to confirm that the conductive chassis of a device is safely connected to the earth ground pin on the power plug. This assures protection against shock hazards even if the equipment suffers an internal short to the chassis. The current would be shunted via the ground wire and would likely trip the breaker or blow the fuse. Ground continuity is performed by applying a low current (e.g., 50 mA) and calculating the resistance from the ground pin on the power plug to selected locations on the exposed surfaces of the DUT. 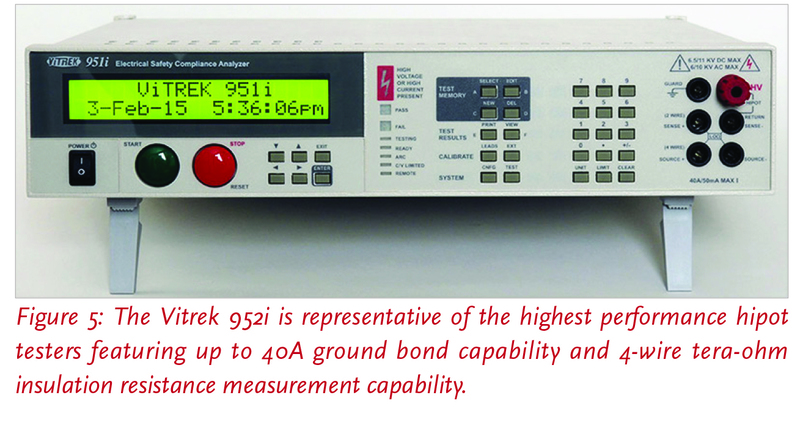 Where ground continuity measures the resistance of the safety ground connection, the ground bond test assures the integrity of the connection. Using the same test setup, a high current is passed through the circuit. If the ground bond is solid, the current passes without a change in resistance. If weak, the resistive heating of the current would induce a failure of the bond. 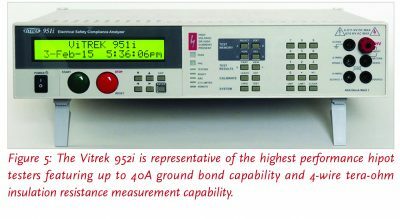 4-wire milliohm meter – providing a Kelvin connection for highly accurate low resistance measurements. Electrical safety testing is a universal requirement for electrical and electronic equipment. Testing to the specific regional requirements can be a daunting task that is simplified by the programmable features and functionality of advanced hipot testers. Reviewing the desirable features of testers, based on the actual testing requirements, can and will result in more efficient and reliable testing.